NARS Beach Lover ($49) is a five-piece, travel-sized set for eyes, lips, and cheeks. I have one of these beauties to give away. 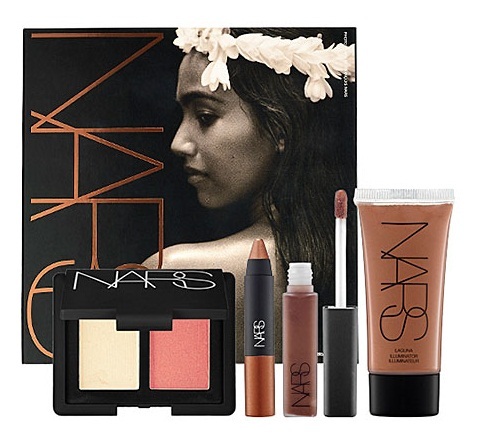 The set includes iconic NARS shades for an idyllic summer glow, including a limited-edition shade of Laguna lip gloss. I actually purchased this for myself, but decided I have too much new makeup and need to share - even this - with my readers. The set contains the following nicely sized items. I'd really like to see the Laguna Lip Gloss. I hope that we can get a photo from the winner! The deadline for entries will be Saturday, July 28, at midnight. The next morning, I will use a random number generator (random.org) to select the winner. I will e-mail the winner on Sunday morning. The winner will have 48 hours to reply to my message and provide a shipping address. After 48 hours, the prize will be forfeited, and another winner will be selected. Make sure to check your e-mail - and look in your spam folder - when the contest ends. What a sweet summer giveaway, thanks! I subscribe through GFC and Google Reader, both. What a terrific little contest, and I love your blog; it's so 'real' (real person, real observations). Thank you for the wonderful giveaway! I follow with GFC and my gmail is cuteandmundane! Thanks CG, great giveaway! I follow you through email. I'd love to try the lip gloss in this set! Looks like a pretty summer shade. you are a lovely lady..thank you for the giveaway..
You're so sweet to do these giveaways! I subscribe thru Google reader. I just retweeted your contest tweet. love to win this for my vacation! Oh I'm totally in love with NARS products! Thanks for this summer contest! I follow this blog by e-mail subscription. Such a lovely giveaway as usual! Thank you so much for hosting this my dear!! I dont have any NARS brand make-up. This would be a great place to start! I wanted this kit so bad! Thanks for the great giveaway CG! Fabulous contest, would love to win! I acquired my first NARS product (Gilda blush) through a blog sale and it is wonderful. I'm crossing my fingers for the draw. I follow by twitter and RT'd your tweet. I will email you that info. Hi, a very sweet giveaway. what a lovely set! thanks forthe opportunity! just tweeted this too: my one weakness @BTiBeauty NARS Beach Lover Giveaway Contest - such a pity we can't get this set in NZ! Beautiful giveaway as always! I follow on GFC as The Blossom Shed and via email as theblossomshed at gmail dot com. would love to win . I would love to win NARS Beach Lover travel sized set. Wow!!! Thanks for your generosity! Simply beautiful like all yoru giveways! follow through google reader and email subscription. These colors were made for me! I have had my eye on several of the NARS kits for summer, and they're all good. That set is just stunning! Thanks for another fantastic giveaway. I follow by email, twitter, gfc, etc. This looks wonderful. Another great giveaway. Thank you! I am an email subscriber. Oh I'd love to win this. Thank you so much for the giveaway! I've had this on my wish list! LOVE Nars! Thank you for the giveaway dahlin! Very beautiful! I have been cautious about Nars, I know it is a wonderful line, but the color is overwhelming, just looking at the counter. As a more mature customer, I shy away from too much glitter, glitz and strong colors. This, however, seems very fresh, natural and yes, glowing! I follow you on fb, and via email, and never fail to read! You are so very generous! Lucky will be the one who gets this wonderful package! This looks like a great set! Great giveaway, thank you for the chance! Thanks for the giveaway, I am dying to try Nars as I don't have it in my country! Thanks so much for a great giveaway. Please enter me. Loving your blog... I think we have very similar tastes, judging by the products you buy and enjoy. I'd love to win the contest but I never seem to ever win at these things. I guess there is a first time for everything right? I would love this prize!!!!!!! aah! perfect makeup kit for the tropical weather at my place! i am subscribed to your newsletters by email and also follow on twitter. i've had this on my wishlist! thanks for the great giveaway! I've had my eye on this set for awhile. Thanks for the give away! What a fabulous giveaway! Thanks for the chance. This is a fantastic giveaway! I follow you through twitter. I've retweeted your contest! Once again, another FABULOUS giveaway. Thank you so much!!! What a BEAUTIFUL giveaway! Thanks for the chance at winning such fabulous products! Neat Nars giveaway contest. Their products are sublime!! That's Marie (from France) ... again! I'd love to win a bit of Nars! Nars is always at its best in the summer. Thank you for the contest. Would love some new makeup for summer! The Domestic Goddess (Care) was unable to post a comment today. I have no idea what Google was doing to her. I'm posting her entry for her. Hope this isn't happening to others! Nars has become a favorite! I just followed through GFC "studdedbows". What a perfect collection of goodies for summer! Thanks for sharing this one! I would love to have these NARS products. these products look so fun for summer. I would love to try them. This is an amazing giveaway. I subscribed through GFC, and am a email subby. I love Nars! Thank you! Thank you for the wonderful giveaway once again! I subscribe to your blog through email. Thanks! Oooh such a cute set! I love NARS :) Thanks so much. What a generous giveaway! That Laguna lip gloss looks amazing! p.s .. firtstimer to your blog but love reviews i read. Such a lovely giveaway as usual! Thank you so much for hosting this my dear!! Such an unbelievable giveaway! Thank you for the chance to win. Here is my mandatory entry comment :-) Thank you! Entry #2: I follow you via GFC as Laura Milan.